In 1697, following the example of Bristol in the previous year, Shaftesbury successfully promoted a private Act of Parliament (9 & 10 William III, c.48) for the "construction of workhouses and houses of correction for better employment and maintenance of the poor." Little appears to be known of any workhouse that was subsequently constructed. A parliamentary report of 1777 listed a parish workhouse in operation at Gillingham for up to 70 inmates, but none in Shaftesbury (or "Shaston" as it was listed). Dorset: Ashmore, Compton Abbas, Fontmell Magna, Gillingham (2), Iwerne Minster, Margaret Marsh, Melbury Abbas, Motcomb [Motcombe] (2), East Orchard, West Orchard, Shaston St Rumbold alias Cann, Shaftesbury—Holy Trinity (2), Shaftesbury—St James, Shaftesbury—St Peter (2), East Stour, West Stour, Stour Provost, Sutton Waldron, Todber. Later Additions (all from 1894): Alcester, Bourton, Buckhorn Weston, Kington Magna, Shaftesbury, Silton. The population falling within the union at the 1831 census had been 13,869 with parishes ranging in size from Margaret Marsh (population 86) to Gillingham itself (2,520). The average annual poor-rate expenditure for the period 1833-35 had been £8,882 or 14s.6d. per head of the population. In 1836, the Poor Law Commissioners authorised the union to spend up to £4,000 on the building which was to accommodate 250 inmates. Work began on the building the same year, at a site in the Castle Hill area as the south-west of the town. Continuing difficulties in financing the construction hampered progress, however, and during this period workhouse accommodation was provided by the former parish workhouses at Gillingham and Motcombe. In 1838, a further expenditure of £2,000 was approved and the new building finally opened in 1840. The building was designed by William Walker and was based on the Poor Law Commissioners' model "square" plan published in 1835. The site location and layout are shown on the 1929 map below, by which time it was known as Shaftesbury Poor Law Institution. After 1930, the workhouse became Shaftesbury Public Assistance Institution. The building was demolished in 1947. In January 1912, the Shaftesbury Union opened a children's cottage home. The following year, an arrangement was made with the Sturminster Union, wherebey the Shaftesbury home would be used to house the girls from both unions while Sturminster would provide one for all the boys. The Shaftesbury cottage home had closed by 1919. 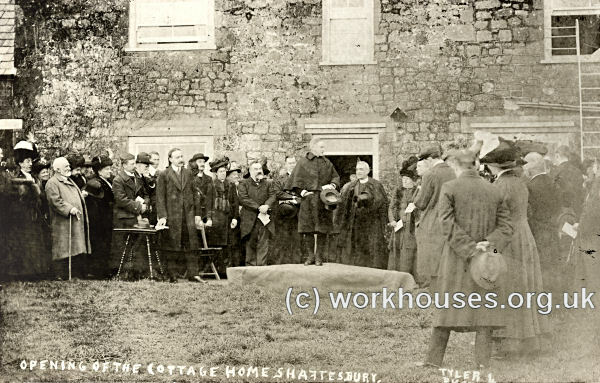 Shaftesbury Union Cottage Home opening, 1912. Dorset History Centre, Bridport Road, Dorchester DT1 1RP. Relatively few records survive. Holdings include: Guardians' minute books (1835-40, 1883-1930); Ledgers (1903-30); etc.